Get creative! You can go as simple as a candle sitting on the mantel – to different sized candles in glass containers at different heights. The sparkle and the yummy scents will bring dimension, style and great smells to the room and help your fireplace feel like the epicenter of all things fall. Pro tip: try the Brown Sugar Chestnut Candle to get your house smelling extra nice for the season. You can’t go into a store today without seeing a customizable sign. Take a simple frame with slots for letters and spell out your favorite quote. Or, go a little deeper and get a chalk style board, adding your personal touch with handwriting and design. Add a family saying, your favorite verse from the song you can’t stop singing, or just a word of encouragement will lighten up the mantel and bring smiles all around. Dress up your mantel with festive fall flowers. From the dollar store to a ritzy florist, you can find the orange, yellow and rustic brown hues you desire. Grab an old mason jar as a vase and start putting together the fall colored flower arrangement that is sure to grab any guest’s attention. Pro tip: string together some fake leaves and wrap them around the edge of the mantel to pull together the entire look! No fall mantel would be complete without a traditional pumpkin or 12 sitting strategically across the top. With fake fruit or real, the traditional look of a few beautiful orange pumpkins on the mantel captures the epitome of fall. Aside from pumpkins, is the idea of switching out the ordinary for a different, yet equally seasonal move. Change out the pumpkins for apples! A subtle switch can give your mantel the envy of neighbors. 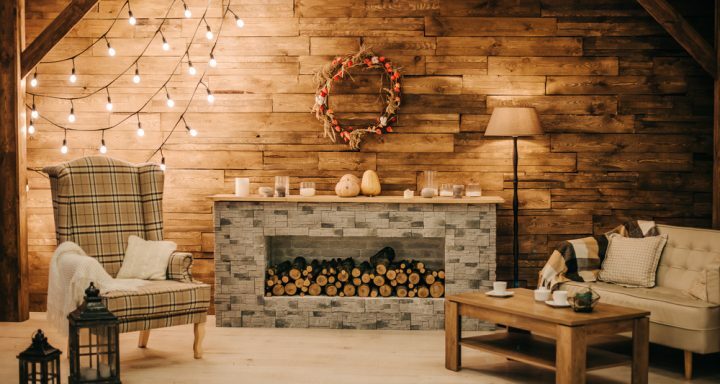 Looking for more fireplace fun? Check out this blog on how to keep your beautiful fireplace safe this fall!